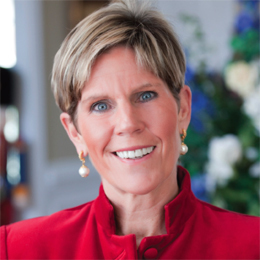 Patti Brennan has made quite a name for herself in the financial planning world. As President and CEO of Key Financial, Inc, she works with people every day to help plan their financial goals—from putting away money for college to estate planning, reducing income taxes and getting them on the right track toward retirement. Her passion for her job and dedication toward her clients is unmatched, and those are a few reasons why she is consistently named one of the top financial advisors in the country, including one of Barron’s Top 100 Women Advisors in the Nation for 10 years. Recently, Brennan received a prestigious award from Forbes as one of the Top 100 Wealth Advisors in the United States. She also gives back to the community and currently resides on the boards of Brandywine Valley YMCA, Cuddle My Kids, Royal Alliance Advisory and eMoney Advisory. While you attended Georgetown University, did you know you wanted to go to- ward the path of becoming a financial advisor? I actually stumbled on this profession by taking one class my senior year called “Financial Planning.” I loved this class because it seemed so practical, and I could see the profound impact a financial planner could have on a person’s life. I was drawn to it for the same reason I was drawn to nursing. If you’ve ever been really sick, you know the impact a great nurse can have on how quickly you get better. Not only are they incredibly competent, a great nurse can deliver the care with empathy, encouragement and the confidence that it’s the right thing for that patient. While fundamental principles of the human body and financial success remain constant, every patient is different, and so is every client. You are consistently ranked as one of America’s top financial advisors. What sets you apart from others in your field? What I came to learn after receiving these awards is they aren’t only looking at the largest brokerage firms or banks. Bigger isn’t always better; it’s about quality and who is really delivering for our clients. Credit really goes to the people at Key Financial. We are a ver y, ver y deep bench. Our client advocates are highly intelligent people with advanced degrees who are doing analytical work to give us every strategy and every possible idea to make sure we’re doing everything we can for our clients. Each of these publications have their own methodology and criteria, and while I couldn’t do it any other way, it’s a wonderful validation that we are doing things right. What financial services does Key Financial, Inc. provide? Most people think financial advisors just invest their money. Some do. I believe a great advisor does a lot more. We run lots of cash flow and tax planning scenarios to see how we can optimize on all levels. Is a client able to save and if so where is it going? What strategies can we employ to reduce taxes, which will ultimately increase their cash flow and improve their net worth? It’s wonderful to see the impact, year after year on a client’s important goals. We look at the important objectives and the bucket list; will they be able to put the kids through college, do the home improvement and retire at 60? If not, we think, what is realistic and how should the money be invested? We don’t invest around an index; we invest around goals. What do you tell people who think they are in control of their money and don’t need a financial plan? Sometimes, people really don’t need an advisor, but it’s important to recognize that people don’t follow plans just like they don’t follow diets. Planning is a verb, not a noun; it’s not a onetime thing. Planning monitors progress—it’s the scale. The tools we apply are what makes the whole process easier to follow. What do you find most interesting about your job, and what do you love most about being a financial advisor? I love the relationships that develop over time. When you get deep with people and learn about their successes, their worries, their families and their history, there is a bond that occurs that rate of return just can’t measure. Don’t get me wrong—rate of return is important, and getting things done behind the scenes is critical, but it’s so rewarding to know we have applied principles of sound financial management to their unique circumstances. Clients trust us and know that when things need to occur, we are going to do it so that they don’t have to. You are married with four children. How do you balance work, residing on various boards and quality family time? Like Suzy Welch said, I don’t believe in work-life balance, and I think we are misleading our young adults by promoting that. It’s about work life choices, and there is a result that comes from those choices. Early in my career, there was no real balance. I was focused on my clients and the four little kids crawling around my ankles. We had no social life and there were no real contributions to community. But the early choices have put me in a position now where I can have those other things, too. Now I have four wonderful young adults, an amazing marriage and a business that is thriving even beyond my wildest dreams. I believe that in America, you can have everything you want in your life, just maybe not at the same time.